Currently, one in four American adults suffers from a mental disorder. As research has advanced in the areas of mental health, criteria by which various forms of mental illness have been diagnosed has expanded to include both severe forms of psychiatric disabilities such as schizophrenia and less severe forms such as anxiety disorders. Despite these recent advances, African American women are less likely to utilize mental health services than their White counterparts. 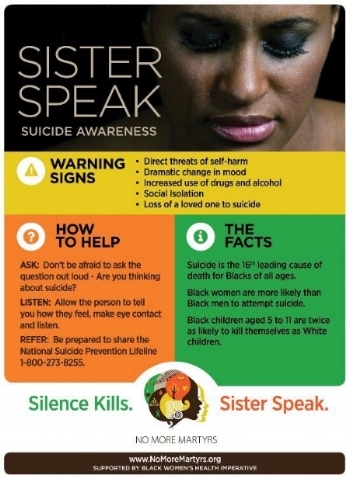 No More Martys launched Sister Speak to build awareness of the signs of suicide in Black women. Receive the latest information regarding No More Martyrs delivered directly to your inbox. Sign up today!